Today's is a Sirhley's2Girls members blog hop. Below are two cute free digi's that I had some fun with. Don't you think these are fun? Join us over on SNR and become a member! How about a prize? In addition to the fabulous eye candy, we have decided to hide a prize somewhere along the hop! One pre-selected blogger will draw a random winner from the comments on her post, and the winner will receive a free stamp from Shirley’s2Girls. The fun part is...we're not telling you who it is! So as you hop, make sure you leave comments on every post so you have a chance to win!! We will announce the winner on Monday in the SNR S2G Forum. Thanks so much for stopping by! 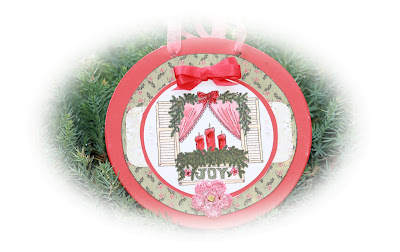 Now it's time to hop on over to Ellen's blog to see her fabulous creations! Enjoy the hop & have a wonderful Saturday. Happy Monday friends...and can you believe we are into October? I know it's the 5th, but didn't school just get out yesterday? Summer zoomed on by and now we are into fall. I am thankfully on the mend...just dealing with a cough that is being stubborn. It still makes my voice go crazy at times. I go from being normal to sultry to a croaky frog, hehe. Hubby is fighting the beginnings of something & so far (fingers & toes crossed) our son is good to go. He is way toooo busy to be a sickie. Football later this afternoon...straight from work to the field. Today's projects are a highlight of two of the three challenges I entered for World Card Making Day. The first was from Magnolia-licious and it was to make an ornament. Nice to do something different & make me think outside the box. We could use any image and I choose to use the new Lockhart Holiday Window from Susana's store. These are just so sweet and a ton of fun. I used liquid glaze on the candles and even added Shimmerz in Royal Red to that wonderful hand made flower for an added effect. Wynneth was such a sweetie to make some for me. They are just adorable and so versatile. My second entry was for the Sugar Nellie challenge. This cutie is a Sugar Nellie stamp called Pen Pal created by Elizabeth Bell. Isn't she just a cutie? I just love Elizabeth's images and will be collecting them all. I used the yummy Basic Gray -Lemonade paper and the card stock was from CTMH. This was so much fun to use & will serve as my MIL's card since today is her birthday. We were going to take her out to dinner tonight but she had other plans. She did say birthday's can be celebrated for up to two weeks after the actual date. I didn't know that & will use that from here on out. Happy Birthday Phyllis! I hope everyone has a super week. I am on a time crunch to get this post in. I created this sweet Lockhart image for Susana's challenge. We needed to use Christmas colors and a stamp from the store. Well here you go...I also used paper from the store. I love using this stamp. Just so relaxing & using liquid glaze on the apples makes them look so yummy. Hope you had a great weekend. I am starting to feel better...but now Steve's throat is hurting. What is up with the sharing?